My other half looked unimpressed. “So you’ll be rolling in drunk at about half past four,” she repeated. Several hours later, I was congratulating myself on the successful purchase not only of some hot food but also of a book to read while eating it (if I was going to have lunch at 3.30, it seemed extremely important to have something to read while I was doing it). Neither a beef stifado nor Gary Morecambe’s memoirs of his father Eric would necessarily have been my first choice in normal circumstances, but at that moment they seemed to be just the job. (There was something deeply poignant – really deeply poignant, I mused – about the combination of how much Gary Morecambe had to write about… and how badly his book was written… really deeply poignant…) Also, I’d managed to select and pay for the book and the food without wobbling noticeably or otherwise attracting attention, even though my feet had for some time been doing that caterpillar-track thing when I walked (you know the gait I mean – short regular steps in a straight line, a kind of semi-controlled upright stagger). I was really quite drunk, I acknowledged ruefully as I came out onto the street. Still, at least the street in front of me wasn’t moving down and to the left before my eyes. This comforting reflection lasted for a second or two, after which I noticed that the street in front of me had started moving down and to the left before my eyes. Four hours earlier (this is turning into The Event…) I arrived at Piccadilly Station about five minutes late, alternately cursing myself for not setting out earlier and reassuring myself that the Twissup party would be easy to spot – all I’d need to look for would be a group of ten to twelve middle-aged blokes like me, one or more of them wearing Marble T-shirts, heading down Station Approach en route to Rochdale Rd. Fortunately the group hadn’t yet set out, as I was wrong three times over – Dom rather unsportingly wasn’t wearing Marble gear (although he was recognisably Dom); we rapidly left Station Approach in favour of a more direct route involving an assortment of car parks and back alleys; and – most importantly – there were about 92 people there. OK, not 92, but there must have been getting on for 40 of them: it was a huge crowd. Oh, and some of them were women – although not, it has to be said, very many. As a Twissup newbie I didn’t actually know anyone face to face, and as a non-user of Twitter there were quite a few people I didn’t even know online; it was slightly awkward for a while, with a few of those moments when you realise that the three other people you’re talking to have all been hanging out together for years. But I got talking to rabid Glyn, Hard Knott Dave, Barm and Zak, along with a number of other people not all of whose names I can remember at this stage. Also, there was beer, which helps with the socialising (at least, it does until you get to the stage of caterpillar-track feet and deeply poignant thoughts). Ah, the beer. Oh good ale! First there was a glass of bottled Dobber to start the brewery tour with. A Twissup is no place for tasting notes, but I can say that I haven’t much liked Dobber in the past – I positively hated it the first time I drank it – and that this was rather fine; so much so that I was one of those who went back for seconds after the tour. (Which didn’t take very long – it’s a small brewery. Thanks to Zak for asking all the intelligent questions the rest of should have thought of, and to Dom’s colleague James for some fascinating information – not least, the revelation that the Chocolate Dubbel is in fact neither.) Then it was back up the road to the Marble Arch, which accommodated thirty-odd thirsty twissers with remarkable ease – surprisingly so considering that the Saturday lunchtime trade was in full swing by this stage. With pints being ordered all around me, I decided to be relatively moderate by going for a half of Dave’s 6.2% Infra Red. (Should be hoppier, said Dave. Tastes fine to me, said I.) However, the problem with halves – even strong ones – is that they don’t last very long. With pints still being ordered all around me, I went with the flow and had a pint of Ginger. When I’d got to the bottom of that and people were still showing no sign of moving, I went for a half of Lagonda IPA – like the Dobber, this was not a beer I’ve ever much liked before, and like the Dobber it was rather nice. Then it was off to the Angel (the Manchester Angel?) which for a moment didn’t know what had hit it; I sneakily checked the blackboard and got my order in at the side of the bar while most of the throng was still eyeing up the pump clips. (Hornbeam Mary Rose, a darkish but hoppy bitter, very nice.) I got talking to Tandleman, who had joined the group here, and even met the legendary Cookie. A half of someone-or-other’s perfectly pleasant but not particularly memorable porter followed, and then we were off again and heading for Bar Fringe. I decided I’d rather do this stretch of the route alone, for whatever reason – there may have been some poignant thinking involved – and contrived to head out of the Angel midway between two groups. By the time I got to Bar Centro I couldn’t see either of them, although this may have been partly because we weren’t in fact going to Bar Centro – a realisation which hit me as soon as I got there. After a short but essential detour to use the facilities of the Craft Centre nearby, I made my way back to Bar Fringe. Both the Marble Arch and, to a lesser extent, the Angel had displayed remarkable Tardis-like properties: they’re quite small to look at, but when put to it they absorbed a huge and thirsty crowd without much apparent strain. Bar Fringe is small to look at because it is small, and by the time I got there it was rammed. The Fringe’s USP has always been its European beer range, which is remarkable (if rather pricey); I felt I should bypass the handpumps for once, opting instead for a half of the seldom-seen Duvel Green (6.8% to its big brother’s 8.5). This was, of course, a mistake: a beer like this demands to be taken slowly and savoured, which is hard to do when you’re half-drunk, footsore, dehydrated and standing in the middle of a hot, noisy, crowded pub. Reader, I necked it. The next bit you already know (although I’ve got no memory of actually leaving the Fringe). After getting some food down me I headed unsteadily for the bus home, intending to stay on to the terminus and come back again; the reasoning was that this would give me a chance to sober up. (Another drink or two and I wouldn’t have cared how drunk I was, or indeed been aware of it. Maybe another time.) In fact I passed out on the bus, but woke up in time – feeling a lot better for it – and… well, rolled in drunk at about half past four. That woman’s psychic, I tell you. Anyway, Marble have recently brought out two new bottled beers, both brewed using Westmalle famous yeasts: Westmalle for the “Chocolate dubbel” [sic], Duvel for the “Vuur & vlam”, which is a strong American-style IPA. (“Vuur en vlam”, meaning “fire and flame”, seems to be a common name for some Dutch beers is the name of an IPA from Dutch brewery de Molen; the Marble’s version was brewed originally for a Dutch beer festival, where all participating brewers were invited to compete in offering their own “Vuur en vlam”. The Marble came second overall, beating de Molen’s own into third place; not bad!) (Thanks to John in comments for the corrections.) I was at a tasting of Marble’s last four special bottlings a few months ago – the Special barleywine, a new Decadence stout, and ‘frambozen’ and ‘kriek’ variants on Decadence – and I can heartily recommend all four. The Special was particularly remarkable – a hoppy barleywine, would you believe – but all four were striking, and I ended up spending silly money on a bottle of each. (Separate post on silly money prices to follow.) Disappointingly, the new beers are once again only available in those huge 75cl bottles, although the price seems not to be set as high as the last time round. I’m looking forward to checking them out. A short-run seasonal special, apparently. You know that ‘Manchester pale’ style I keep talking about – lots of hops on top of a dry, yeasty flavour with a sour, almost stale-tasting edge to it? This is that. This is exactly that, done very well. If you like that sort of thing, you would definitely have liked this. Interesting. Very dry, very hoppy, but with a smoky depth to it; I found I was thinking of this as a tall flavour, if that makes sense. I didn’t actually like it, but if you’re into beers with no discernible malt flavour you should certainly give this one a try. Yellow, sour, hoppy. Sourly hoppy, in fact – it’s made with Citra hops & as such is quite similar to Pictish’s single-varietal ale. Harsher, though – it’s a full-on hoppy ale, as the Marble’s often are, with a bitter attack in mid-mouth. ‘Manchester pale’, check; hops, dry yeasty flavour, sour edge to it, check. (Especially on the nose. If they ever put this into production they’ve got to do something about the way this beer smells as you lift it – it’s really not good.) But this is 5.9%, which is very strong for Marble beers, and the strength hits you in a big, heavy, slightly apple-y flavour in the middle of your mouth; essentially, this is Wobbly Marble. Not bad at all, apart from the nose. This was new, expensive and 5.9%, which makes me think it’s probably a production version of the 1425. If so they’ve fixed the aroma – basically it doesn’t smell slightly off, which has got to be good. But something else has happened to the flavour; the uncompromising bitterness and the Wobbly Bob alcoholic richness have blended in a way they hadn’t before, and the result is, as far as I’m concerned, actively unpleasant. I really didn’t like this one. [Second encounter] On gravity dispense, and very nearly flat, it was “a challenging flavour, but one I could appreciate – and I felt that the relative stillness of the beer gave it an extra weight which complemented the heaviness of the flavour, making it easier to get into”. Pale, hoppy and sour. I owe the Marble Brewery a bit of an apology. The taste – and smell – of some of their hoppier beers has a distinctive sour edge, which reminds me of stale beer and (not to put too fine a point on it) vomit. I had assumed that this was a sign of something going wrong in the brewing, but not so – at a recent ‘meet the brewer’ event I saw (and smelled) the hops the brewery uses, and one of them has exactly this smell. As does this beer. It takes all sorts. I last tried the Summer Marble a couple of years ago. Then, the bitterness was overpowering – a real clove-oil effect, a bit like a Kölsch – and I found it almost physically hard to drink. This is a much more complex proposition – although once again it’s a full-on beer, and once again it’s hops all the way. There’s a metallic bitterness first of all; get through that and you can taste two distinct hop flavours, the lemony Citra balanced by an uncompromising smoky hit at the back of the mouth. Not the pleasantest beer I’ve ever had, but very interesting. There’s a particular flavour, or combination of flavours, which immediately signals “Manchester pale” to me. You get it at the front of your mouth: a flowery, aromatic quality, combined with a slight sourness. It’s probably a particular kind of hops, or a particular kind of hopping, or something. The Tawny has the back-end qualities you’d expect from a dark bitter (malty body, bitter finish), but the front is all Manchester. Nice enough, but not quite my thing. Very pale, very hoppy: one of those beers with a full-on hop attack, combining bitterness and that odd sour smokiness. Light, fruity sourness in the body and a clean, easy-drinking finish; it’s all happening at the front of your mouth. Heavy, creamy and distinctly sweet, is the first impression. Lots of hops behind that; a definite metallic bite, with a hoppy finish at the back of the mouth and cloves on the tip of your tongue. Very much in the area Abbeydale have been staking out, but more full-on (as is the Marble’s wont). A bit of a hostage to fortune, surely? Surprisingly enough, this is a brown, malty bitter, although the malt character doesn’t develop very far before the bitter hop finish slams down on it. Not bad at all. Back in pre-vegan days, the Marble used occasionally to brew a porter called McKenna’s Revenge, and what a porter it was too – a really distinctive flavour consisting mainly of shovelsful of malt, balanced by just enough bitterness to stop it being cloying. This isn’t that, sadly; more of a ‘dark bitter with stout overtones’ kind of porter. File under ‘perfectly pleasant’. Very dark, not very sweet; if you had this and the Boggart porter in a blind tasting you’d be hard put to identify the mild. The slightly sour flowery front end and the bitter finish are present and correct; in the middle there’s a bit more going on than usual, but it’s not really distinctively mild. Darkish, malty and strong, with a bit of hop bitterness cutting through and that particular smoky, queasy nose that the Marble’s hops tend to have. (Sorry, I’m just not a fan.) If you like Marble bitters, this is the kind of dark bitter you’ll like. Not very tawny, as it goes, but a lot browner than the average Marble bitter. A lot of bitterness there, but a lot of flavour too. Not a million miles from the Well Cut mild, but a less aggressive flavour & strength (4.5%). Really very drinkable. A good strong mild is a thing of beauty. (If you like mild, and you like stronger and darker bitters, what’s not to like about a good 6% mild?) But strong mild is also an oddity – almost a contradiction in terms – and a rarity with it; this is only the second example I’ve come across, the other being Sarah Hughes’s Ruby Mild. Well Cut is good, but it’s nowhere near that good; lots of malt and tannic bitterness, but not enough sweetness. Would also lose points, if I were giving points, for playing silly beggars with pricing (see also Decadence) – yes, it’s seasonal and yes, it’s unusually strong, but £3.20 a pint? Give over. A great big flavour with a definite malty fruitiness and a big thud of alcohol (it’s 6% a.b.v.). Midway between a light-ish mild and an old ale – one hell of a between. It’s a stout – heavy, bitter, espresso-dark with a tight, creamy head – and then it’s not. More specifically, something strange happens around the middle of your tongue, where the malt and the burnt-grain sourness usually kick in: there’s some of that, but there’s also a big sweet dollop of, well, chocolate. It really shouldn’t work, but it really does. It’d be interesting to compare it directly with Orval, which isn’t a stout but works a similar trick of simultaneously tasting like (a) plain chocolate (b) marmalade and (c) beer. The Marble brewery’s only recently got into bottled beers; most of them are 500ml bottles selling for £2.80, which is a bit steep but worth it for something like the bottle-only 6% Ginger Marble, which is rather fine. Decadence was a late addition to the range: an 8.2% stout sold in a 330ml bottle (with a painted label), for £4.50 a throw. Call me a skinflint, but to my mind £4.50 is a ridiculous amount for a bottle of beer. So the chances are I won’t be getting this again – but I’m very glad I tried it, & I’d recommend anyone who likes beer to try it once. What’s it like? Think of Dragon Stout, then multiply by Guinness Foreign. Think of the deepest, fullest-flavoured Trappist ale you’ve ever had, and add that. It’s the kind of flavour that rushes up to meet you and then keeps on going, enveloping you and then unfolding some more. Ink metaphors are hard to avoid with stout, and what this one reminded me of was the way black ink on wet tissue paper spreads out and unfurls into shades of blue. Shades of malt, in this case; shades of ale. It’s like swimming in beer, or possibly drowning. Really very nice indeed. Still ridiculously over-priced, though. When the cider’s off and the guest beers both have ‘white’ or ‘silver’ in their names, you can always rely on a Ginger. I used to get Brendan Dobbin’s bottled alcoholic ginger beer sometimes; this isn’t quite up to that standard (that was quite extraordinary) but it’s a very fine pint. Essentially it’s my pet hate, a Manchester-style pale bitter, but with some of the hoppiness and most of the sourness swamped by, well, ginger. (You can actually taste the ginger – it’s not just heat.) Not really a session beer – I had four one evening shortly after it came in, and felt quite peculiar the next morning. The 6% Ginger Marble, usually only available in bottle. I wasn’t very taken with the bottled version, but this was terrific – all the plus points of the normal Ginger, bedded down on a deep alcoholic richness of flavour. Think of an Abbey-style Triple and you won’t be far off. It was Christmas Eve a couple of years ago when I went to my local and noticed that they had the Marble Port Stout on. There wasn’t a price for it, so I asked how much it was. They said it was free. That had never happened to me in a pub before, and will probably never happen again. (It was nice, too.) I’ve had the Stouter Stout before and not liked it much. A draught stout is a difficult thing to get right, and in that earlier pint I couldn’t taste much apart from great slabs of inky burnt-grain sourness. (A real aficionado probably doesn’t mix beers, but I have to admit I’m partial to a black and tan, precisely because the bitter hides the sourness of the Guinness. Or rather, the sourness of the bitter and the sourness of the Guinness cancel each other out, somehow – with the right bitter, a black and tan tastes of almost nothing at all.) This one, anyway, was a lot better; the sourness was still there, but well down in the mix. A big, dark, bitter stout – inky in a good (metaphorical) way. As distinct from the earlier one, you understand, which actually tasted of ink. Pete‘s done it, Mark Dredge has done it, the Curmudgeon‘s done it and Barm‘s refused to do it. Time then for me to do it: to say what would be on my ideal jukebox. I’ve got quite mixed feelings about background music in pubs. (I exempt music sessions and singarounds, which are about making music rather than having it in the background, and which don’t invite an audience: if you’re listening, the chances are you’re also playing or singing.) The only kind I can’t stand is the kind that’s too loud to hear yourself speak; I don’t even like that kind of volume in a club for as long as I’m not actually dancing, and in a venue where you can’t dance it seems downright perverse. I’m not crazy about piped music, or amplified live music for that matter, where it’s loud enough to be intrusive; too much of that and you start hankering after silence. But relatively quiet music can make a good backdrop to a drink and a chat. The big exception to the rule about intrusively loud music is the jukebox, which I appreciate at more or less any volume. Really, the jukebox is commodity capitalism in musical form: it delivers music in discrete packages, each of which can be purchased for the same fee, and by doing so it generates both demand and competition: if you don’t like what someone else has put on, put your hand in your pocket and buy your own choice. All the same, there’s something liberating – empowering, even – about being able to turn your desire for music so quickly and easily into effective demand: a good jukebox lets you dredge up the song that’s going through your head, be it a B-side or a buried album track, and fill the room with it almost instantaneously. It’s not a million miles away from the buzz of singing a new song at a singaround – although obviously in that case there’s more effort involved, and no money changing hands. Anyway, here are some songs I’ve filled rooms with in the past and hopefully will do again. “Where immobile steel rims crack, And the ditch in the back roads stop…” What’s it mean? What’s he going on about? Half a minute later it doesn’t matter. Bliss. For a long time I couldn’t pass the Crescent in Salford without going in, and I couldn’t go in without putting this on the jukebox. (To be fair, I only went down that street about once a week.) “I went down to the demonstration, To get my fair share of abuse…” Them weret’ days. The greatest single ever released. If it doesn’t lift your mood a bit you may be dead. I think we don’t always hear how weird this single is. It sounds as if the elements of a pop song have been shuffled and then put back together; they’re all there but nothing fits properly. It’s only let down by patches of downright ineptitude – he should have got rid of that saxophonist. Today on this programme you will hear gospel, and rhythm and blues, and jazz. And folk, and angsty singer-songwriter introspection, and quite a lot of Krautrock. And Scottish accents. Che Guevara and Debussy to a disco beat. You can’t say fairer than that. A few weeks ago I stuck my nose into Bar 4Eighty and the Lounge Bar, two bars sitting side-by-side on Chorlton’s main drag, and promptly withdrew – not a draught beer in sight. The next time I passed, the Lounge Bar was no more; it’s now trading under the non-Google-friendly name of My Place (or possibly MyPlace, I’m not sure). I went in there for a drink this lunchtime. Still no cask beer, but what they did have was a choice of real cider – something I’ve only seen a couple of times before, and a very ambitious choice for a new bar. The choice in this case was between two polypins, standing uncooled behind the bar, offering Saxon’s optimistically-titled Session Cider (5.8%) and the same company’s Strawberry Fields (6.9%). I had a half of the latter, which was bright red and initially struck me as rather sweet, but turned out to be very nice indeed: the underlying taste of the cider was sharp enough, and strong enough, to counter the strawberry flavour. The service wasn’t brilliant – the barmaid went to give me ice without asking if I wanted it, then realised there wasn’t enough room in the tall tumbler she’d served me with and gave me a second tumbler full of ice, to add as I saw fit. I gave in to curiosity, towards the bottom of the glass, and tipped what was left into the ice glass. With its deep red colour it looked very nice – took me back to drinking Negronis in Italy – but the effect on the flavour was disastrous: it basically killed it, leaving nothing but an undistinguished sharpness. You’ve got to wonder what Magner’s tastes like warm, and how many people ever find out. There was no draught beer, although there was a single unbadged hand-pump on the counter. I got talking to the manager, who said that “the brewery” (I missed the chance to ask him which one) had fitted it today, while he was out, and that it wasn’t what he wanted. What he wanted was to dispense beer the same way he did the cider, from barrels behind the bar – and he intended to talk to the brewery again and get it sorted out. We shall see. I didn’t ask the guy any particularly searching questions, so I may be doing him an injustice here. But what struck me was that he didn’t seem to be any kind of beer geek – at one point he referred to the barrels he wanted behind the bar as ‘kegs’, for instance. Even so, he liked the idea of dispensing beer by gravity, having casks behind the bar and “making a feature of it” – and he clearly thought it would help the bar to stand out, in what’s locally a very competitive market. 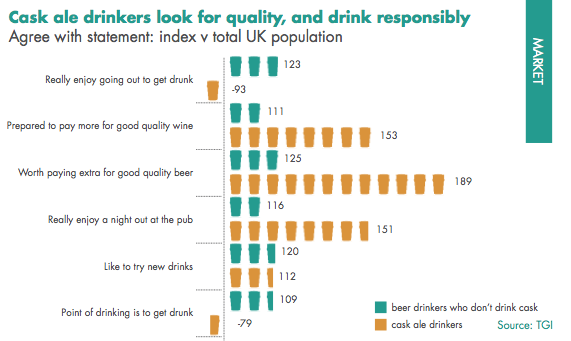 Until fairly recently there were three types of establishment that would have beer on gravity dispense: country pubs which had just never stopped doing it; country pubs which would have stopped doing it if it hadn’t been for the tourist trade; and a few town pubs catering to tickers. 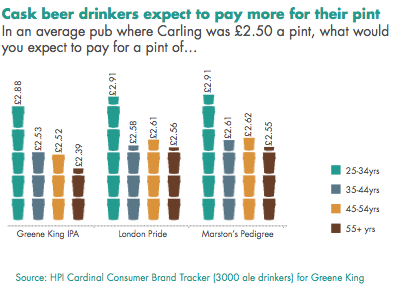 For a new bar to put it on from the start suggests that something is shifting in perceptions of cask ale. I’m not crazy about gravity dispense, as I said back here, but one thing it does do very effectively is differentiate real ale from lager. And that differentiation, apparently, is now a selling-point. An interesting development – although further visits and reports back will certainly be required!